NOT SO GRIM UP NORTH FOR THE TORIES? When it was re-booted after the General Election, George Osborne’s renewed backing for the Northern Powerhouse was seen by some as a political masterstroke. Stealing the thunder of a weak Labour Party, helping to rebalance an economy too dependent on the City of London and rebranding the Conservative Party where it has historically been weak – the Chancellor was labelled a genius by some political commentators. Mr Osborne was banging the drum for his Powerhouse again yesterday – announcing funding for a suite of policies in his Autumn Statement, including a “Northern Oyster card”. Yet Mr Osborne’s claim to have “caught the imagination of a nation” with the policy seems a little overstated. 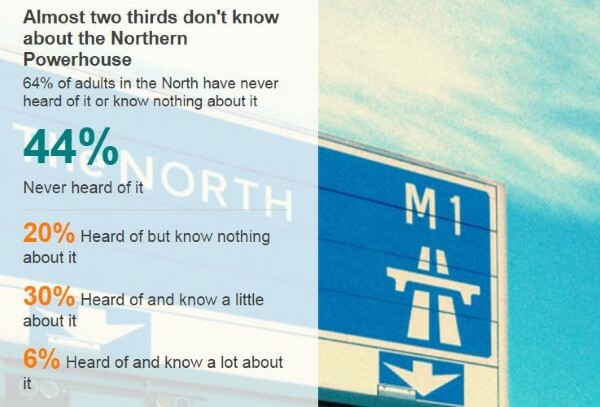 A ComRes poll released last week showed that 44% of adults living in the North of England have never heard of the Northern Powerhouse, while a further one in five (20%) have heard of it, but don’t know anything about it. This does not necessarily mean that the policy itself is doomed to go the way of the Big Society. Our poll also showed that Northerners like the ideas behind the policy – for example, the vast majority think that local politicians in the North, rather than in Westminster, should have control over services like transport and health. The Northern Powerhouse is far from toxic. From George Osborne’s perspective, the problem at the moment is communications-related rather than policy-related. Mr Osborne will not be too worried about this and will have factored in the need for a long-term communications campaign around one of his flagship policies. As the Alastair Campbell adage goes, once you’re bored of repeating the same idea, the public are probably only just beginning to pick it up. At its heart, though, this project has always had more than a whiff of an ulterior motive about it: namely, to strengthen the Conservatives’ base in Northern England and enable it to contest more seats in the region. As my colleague Adam Ludlow argued in March 2014, any rejuvenation of the Tory brand in the North is likely to be “a long, drawn out process”. But it is clear now that progress is being made on this front. We have looked at the voting intention figures from all six of our telephone polls conducted since May 7th and compared an aggregate of these to the actual General Election results from 2005, 2010 and 2015. Unsurprisingly given their upturn in electoral fortunes, the Tories have improved across the country. But this improvement is regionally inconsistent, with the greatest strides made (relative to the 2005 General Election) in the North East, the East Midlands and the South West, as the chart below shows. 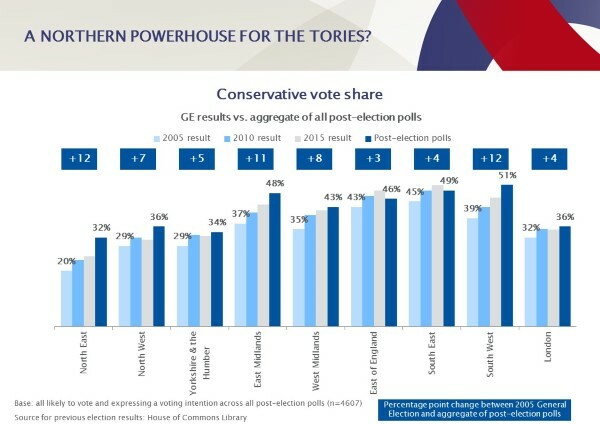 Across the intended engine room of the Northern Powerhouse (the North East, the North West and Yorkshire and the Humber), the picture appears to be improving for the Tories – but this is truer of the North East (where the party has moved from 20% in the 2005 election to 32% in our post-election polls) than the other two regions. Furthermore, as the increased support in the East Midlands and the South West shows, other factors are at work here. In both the North East and the North West, the biggest jumps have been since the 2015 General Election. Evidently, correlation does not equal causation and it would be a stretch to attribute the boost in the North East and North West to Mr Osborne’s Powerhouse given low awareness of the policy. Even with the boost, the three northern English regions remain the worst performing areas for the Tories in England. Undoubtedly, however, the Tories are now in a better position in Northern England than at any time since David Cameron took over leadership of the party. The Northern Powerhouse policy represents a well-timed focus on the North, consolidating the Conservatives’ progress and capitalising on Labour’s troubles. The “detoxification” of the Tory brand in the North was always going to be a long process. For the time being, CCHQ will take some comfort from the fact that this process at least appears to have started.